Main roads to the Argentine capital Buenos Aires have been blocked by people protesting against power cuts. They are demanding government action on shortages that have been affecting many parts of the city. Residents set fire to rubbish bags and tyres on the roads, causing long traffic jams as many left the capital for the New Year festivities. The authorities are blaming the energy crisis on Buenos Aires' worst heatwave in decades, with temperatures over 38C. Some neighbourhoods have been without power for two weeks, with a marked increase in the use of air conditioning. 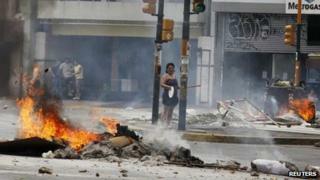 But the opposition accuses the government of mismanaging the crisis. Buenos Aires mayor, Mauricio Macri, says President Cristina Fernandez de Kirchner should change the time zone in the east of Argentina - where Buenos Aires is - to save energy. Mr Macri, a former ally of Ms Fernandez, said the private energy suppliers cannot take all the blame for the crisis. "Private companies are also responsible, but the main responsibility is with the federal government," he said. "The government must control to make sure there is an investment programme, which has not happened in the last decade. And now we are regretting the consequences of that," Mr Macri added. Argentina's ageing power grid has been struggling to keep up with demand. The government is supplying emergency help for those in need amidst the high temperatures. But many are protesting about the lack of service, says the BBC's Irene Caselli in Buenos Aires. The road blocks included the main highway that connects the capital city to the coast, which is a popular destination for summer vacations. On Monday, public sector workers in Buenos Aires were told to stay at home in an effort to save electricity. "It's a shame. The truth is that you should not play with people. I'm talking about the private companies, politicians, everything. I'm very angry," Buenos Aires resident Ricardo Alega told Reuters. On Sunday night, electricity demand reached a record high for a non-working day, as residents turned on fans and air conditioning units in an attempt to cool down homes. City officials held emergency meetings with federal officials on Sunday in an effort to co-ordinate assistance to those left without power for days. An estimated 11.000 people still had no electricity over the weekend. Hundreds of thousands had suffered power cuts over the preceding weeks. The heatwave is reported to be the worst to hit the city in 40 years.